One of my favorite things to do with my family is to go on a road trip! Not only is it fun to explore a new destination and unwind with loved ones, but driving along historic and scenic highways are an adventure of its own! Many times when we go on road trips through California’s beautiful scenery, whether it be the coast, desert, or mountains, we end up on long stretches of highway where there aren’t any restaurants or convenience stores. When traveling with a toddler, it is essential to pack snacks so you always have some on hand! Packing snacks for a road trip is not only convenient, but is also cost effective, and often times healthier. To kick off summer, my husband, toddler, and I took a road trip to the beautiful desert city of Palm Springs, CA. Knowing we were going to be travelling through the hot desert, I knew what the perfect snack would be: Crispy Green freeze dried fruit. I’ve written before on my blog about how I love taking Crispy Green along for my family’s Disneyland snacks, and they hit the spot while on the road, too! When you’re going to be in 100-degree weather, it is essential to have a snack that doesn’t have to be refrigerated. Since my family makes healthy eating a priority, we wanted to still enjoy healthy snacks on the road without worrying about refrigerating produce. I knew heading into Palm Springs so close to summer that bringing Crispy Green along would allow me to both eat healthy, feel good knowing that my snacks are only made from fruit, and not have to worry about refrigeration. When we take road trips, we like to take our smaller compact car since it is much more fuel efficient. This also means we have to be smart with what we pack. Since Crispy Green’s individual packages are very thin and compact, it is very easy to fit them in our car and luggage where we have very little room. Also while we were going to the water park, the zoo, and all of our other fun trip activities, I was able to fit Crispy Green in my small purse. When you’re walking a lot in the heat, you definitely don’t want to be toting around bulky or heavy items! Crispy Green is only made from fruit – nothing else! It is freeze dried, which is a method that helps fruit retain almost all of its original nutrients. 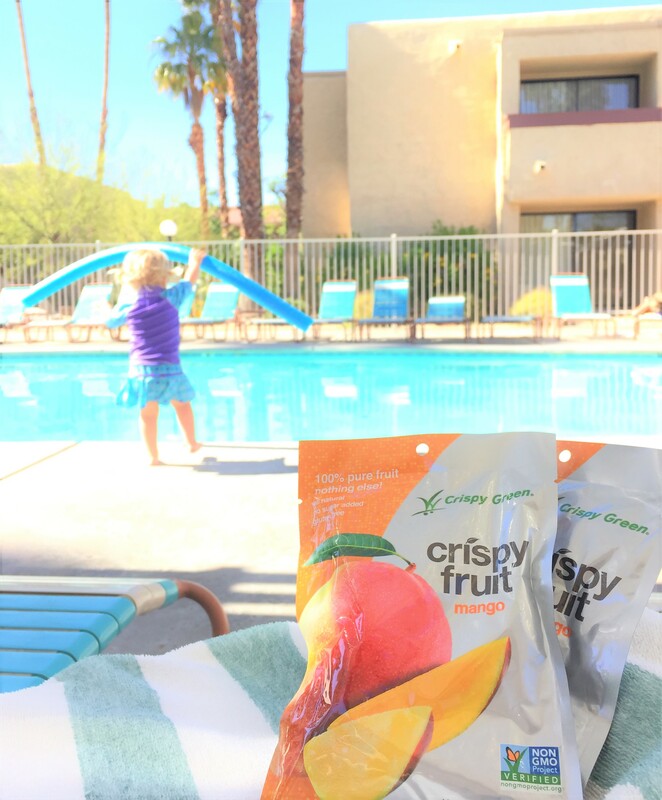 This healthy snack with a delicious crunch tastes very light, and made for the perfect thing to eat while we were enjoying lots of fun playing in the pool. When you’re spending summer days or vacations at the pool, it’s nice to have a snack that is light yet has nutrients to fuel you, so that you don’t feel weighed down! Crispy Green is also great for snacks throughout your whole summer vacation and road trips, as they come in a wide variety of flavors – they never get boring! My personal favorite flavors are mango, apple, and pineapple, but I love them all! My toddler loves the apple and mango the best! They also come in tangerine, banana, cantaloupe, and Asian pear. To learn more about Crispy Green’s freeze dried fruit process and the variety of amazing flavors they offer, be sure to check out Crispy Green’s site here. I would love to hear which Crispy Green flavor you would like to bring most on your summer adventures! And if you’re not headed out on a road trip this summer, Crispy Green’s healthy living website, Smart Lifebites, has lots of great ideas for outdoor activities you can do with your kids.